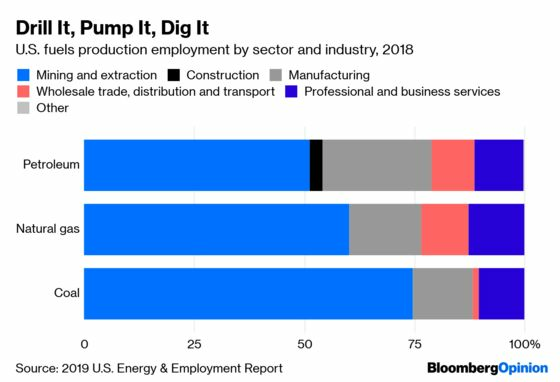 (Bloomberg Opinion) -- The newly published 2019 U.S. Energy & Employment Report reveals that the fuels and electric-power-generation sectors employ nearly 2 million people. 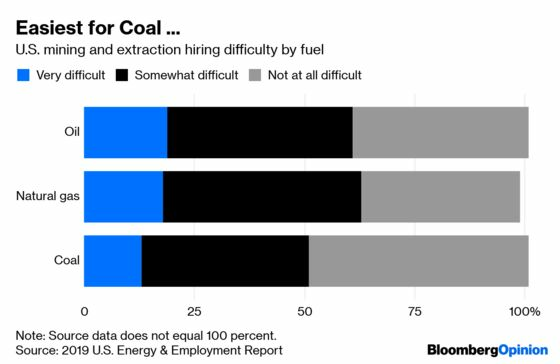 It’s a wealth of data not just on what people do in energy, but also on where employers foresee growth and hiring tightness. A few trends jump out — including that, even in the oil patch, services jobs are a growth industry. In order to explore that services dynamic, it’s important to start with the scale of employment in the three main fuels sectors: oil, gas and coal. One of these sectors, petroleum, is far bigger than the others, employing more than 600,000 people. Gas and coal together employ only 345,000. 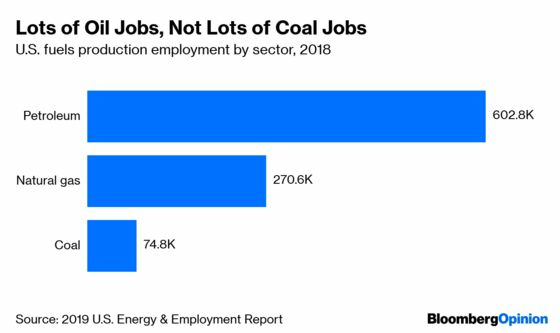 Mining and extraction jobs make up more than half of total employment in each fuel sector; in coal, it’s nearly three-quarters. One-fourth of all petroleum-related employment is in services; in coal, the figure is barely half that much. The report also examines each sector’s hiring difficulties over the past 12 months, but by industry within fuel type. Regroup them by industry across fuels — as I have done here — and some useful trends emerge. The first trend is that mining and extraction are relatively hard jobs to fill in every fuel. However, it’s hardest in gas; it’s easiest in coal, where 50 percent of jobs are filled without any difficulty. 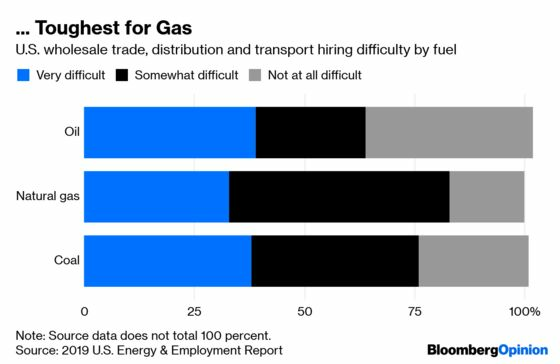 In wholesale trade, distribution and transport, hiring is even more difficult across the board, but it is most difficult in gas. 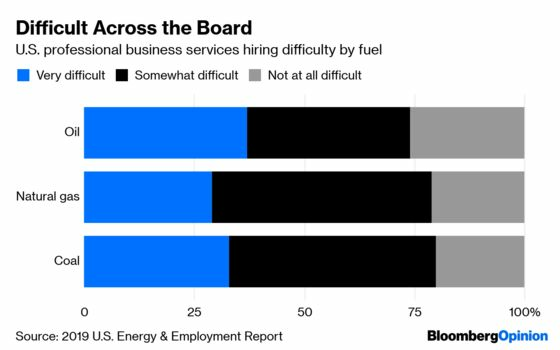 It’s pretty much equally difficult to hire for professional-services roles regardless of fuel type. That finding led me to another useful set of survey data: employers’ expectation of employment growth in 2019. 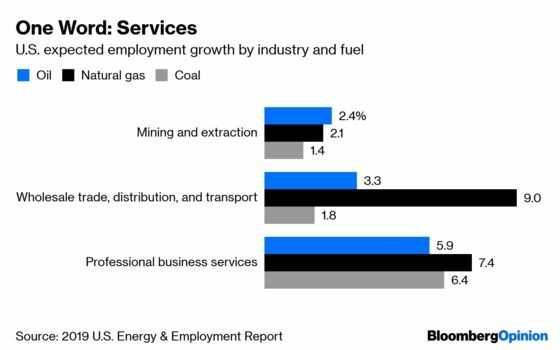 While the bulk of jobs in each of these fuels is in mining and extraction, employers expect the fastest growth in services. The natural gas sector expects significant growth in wholesale trade, distribution and transport as well. It’s worth looking, too, at employment in power generation. Here, the sectors are smaller, but the figures raise some useful questions for employers seeking new hires and policymakers seeking to shore up workforces. 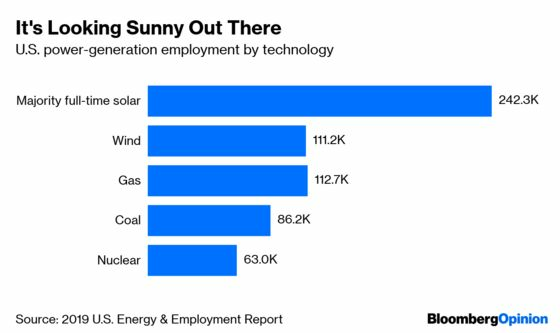 By technology, solar is now the biggest employer in the power-generation sector. Solar employs 242,000 people; wind employs half as many but nearly the same number as gas-fired power employs. So what’s the upshot? Solar and wind have both the highest proportions of their workforce employed in construction and the most even distribution in other industries as well. If you work in nuclear power generation, it’s a 75 percent chance that you work for a utility. 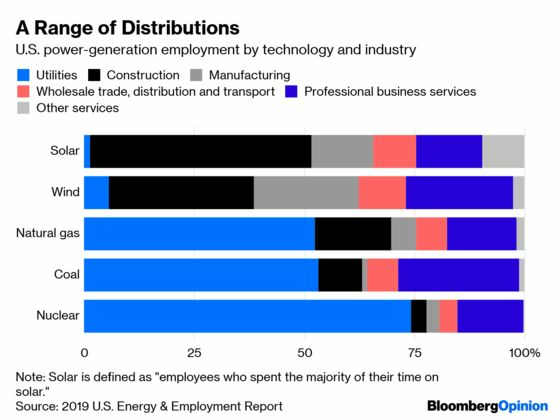 If you work in solar, though, it’s a 50 percent chance that you work in construction (say, building power plants) but almost equal odds that you work in manufacturing, wholesale trade distribution and transport, or services. Wind has a similar distribution of jobs, though with fewer people working in construction and more in manufacturing. The result is a neat trick, in a way. The biggest sectors in electric power generation also employ people most evenly across non-utility jobs. For job-seekers, solar and wind offer the widest range of opportunities — and offer policymakers the widest range of skills to take advantage of, in the field and in the back office. Japan’s energy transition might be for real this time, says Bloomberg NEF’s Iain Wilson. Electric vehicles will displace 350,000 barrels a day of diesel fuel demand by the end of this year; electric buses will help displace 270,000 of those barrels. China’s electric cars hit some potholes, says Bloomberg Opinion’s Adam Minter. Ford Motor Co. plans to invest $900 million in Michigan to build electric vehicles. The operator of six Army Corps of Engineers dams on the Missouri River says the system “was not designed to handle” the flooding brought by climate change and extreme weather. More than 30 Hong Kong construction and property companies have committed to setting decarbonization targets in order to meet the goals of the Paris Agreement. The last hand-painted minibus sign maker in Hong Kong.